For the online game, see Acrophobia (game). For the amusement park ride, see Acrophobia (ride). Not to be confused with Fear of falling. Acrophobia is an extreme or irrational fear or phobia of heights, especially when one is not particularly high up. It belongs to a category of specific phobias, called space and motion discomfort, that share both similar causes and options for treatment. Most people experience a degree of natural fear when exposed to heights, known as the fear of falling. On the other hand, those who have little fear of such exposure are said to have a head for heights. A head for heights is advantageous for those hiking or climbing in mountainous terrain and also in certain jobs such as steeplejacks or wind turbine mechanics. Some people may also be afraid of the high wind, as an addition of falling. This is actually known as added ancraophobia. 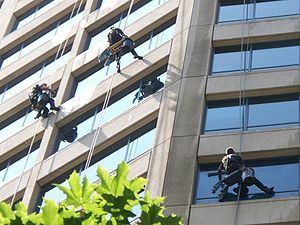 People with acrophobia can experience a panic attack in high places and become too agitated to get themselves down safely. Approximately 2–5% of the general population has acrophobia, with twice as many women affected as men. The term is from the Greek: ἄκρον, ákron, meaning "peak, summit, edge" and φόβος, phóbos, "fear". Traditionally, acrophobia has been attributed, like other phobias, to conditioning or a traumatic experience. Recent studies have cast doubt on this explanation; a fear of falling, along with a fear of loud noises, is one of the most commonly suggested inborn or "non-associative" fears. The newer non-association theory is that a fear of heights is an evolved adaptation to a world where falls posed a significant danger. The degree of fear varies and the term phobia is reserved for those at the extreme end of the spectrum. Researchers have argued that a fear of heights is an instinct found in many mammals, including domestic animals and humans. Experiments using visual cliffs have shown human infants and toddlers, as well as other animals of various ages, to be reluctant in venturing onto a glass floor with a view of a few meters of apparent fall-space below it. While an innate cautiousness around heights is helpful for survival, an extreme fear can interfere with the activities of everyday life, such as standing on a ladder or chair, or even walking up a flight of stairs. A possible contributing factor is a dysfunction in maintaining balance. In this case the anxiety is both well founded and secondary. The human balance system integrates proprioceptive, vestibular and nearby visual cues to reckon position and motion. As height increases, visual cues recede and balance becomes poorer even in normal people. However, most people respond by shifting to more reliance on the proprioceptive and vestibular branches of the equilibrium system. An acrophobic, however, continues to over-rely on visual signals whether because of inadequate vestibular function or incorrect strategy. Locomotion at a high elevation requires more than normal visual processing. The visual cortex becomes overloaded resulting in confusion. Some proponents of the alternative view of acrophobia warn that it may be ill-advised to encourage acrophobics to expose themselves to height without first resolving the vestibular issues. Research is underway at several clinics. "Vertigo" is often used (incorrectly) to describe a fear of heights, but it is more accurately a spinning sensation that occurs when one is not actually spinning. It can be triggered by looking down from a high place, by looking straight up at a high place or tall object, or even by watching something (i.e. a car or a bird) go past at high speed, but this alone does not describe vertigo. True vertigo can be triggered by almost any type of movement (e.g. standing up, sitting down, walking) or change in visual perspective (e.g. squatting down, walking up or down stairs, looking out of the window of a moving car or train). Vertigo is called height vertigo when the sensation of vertigo is triggered by heights. There have been a number of studies into using virtual reality therapy for acrophobia. Many different types of medications are used in the treatment of phobias like fear of heights, including traditional anti-anxiety drugs such as benzodiazepines, and newer options like antidepressants and beta-blockers. Some desensitization treatments produce short-term improvements in symptoms. Long-term treatment success has been elusive. A related, milder form of visually triggered fear or anxiety is called visual height intolerance. Up to one-third of people may have some level of visual height intolerance. In the Alfred Hitchcock film Vertigo, John "Scottie" Ferguson, played by James Stewart, has to resign from the police force after an incident which causes him to develop both acrophobia and vertigo. The word "vertigo" is only mentioned once, while "acrophobia" is mentioned several times. Early on in the film, Ferguson faints while climbing a step-ladder. There are numerous references throughout the film to fear of heights and falling. ^ Juan, M. C.; et al. (2005). "An Augmented Reality system for the treatment of acrophobia" (PDF). Presence. 15 (4): 315–318. doi:10.1162/pres.15.4.393. Retrieved 2015-09-12. ^ Menzies, RG; Clarke, JC. (1995). "The etiology of acrophobia and its relationship to severity and individual response patterns". Behaviour Research and Therapy. 33 (31): 499–501. doi:10.1016/0005-7967(95)00023-Q. PMID 7677717. 7677717. ^ Eleanor J. Gibson; Richard D. Walk. "The "Visual Cliff"". Retrieved 2013-05-13. ^ Jacob, Rolf G; Woody, Shelia R; Clark, Duncan B.; et al. (December 1993). "Discomfort with space and motion: A possible marker of vestibular dysfunction assessed by the situational characteristics questionnaire". Journal of Psychopathology and Behavioral Assessment. 15 (4): 299–324. doi:10.1007/BF00965035. ISSN 0882-2689. ^ Brandt, T; F Arnold; W Bles; T S Kapteyn (1980). "The mechanism of physiological height vertigo. I. Theoretical approach and psychophysics". Acta Otolaryngol. 89 (5–6): 513–523. doi:10.3109/00016488009127169. PMID 6969515. ^ Whitney, SL; Jacob, Rolf G; Sparto, BG (May 2005). "Acrophobia and pathological height vertigo: indications for vestibular physical therapy?". Physical Therapy. 85 (5): 443–458. ISSN 0031-9023. PMID 15842192. ^ Coelho, Carlos; Alison Waters; Trevor Hine; Guy Wallis (2009). "The use of virtual reality in acrophobia research and treatment". Journal of Anxiety Disorders. 23 (5): 563–574. doi:10.1016/j.janxdis.2009.01.014. PMID 19282142. ^ Emmelkamp, Paul; Mary Bruynzeel; Leonie Drost; Charles A. P. G van der Mast (1 June 2001). "Virtual Reality Treatment in Acrophobia: A Comparison with Exposure in Vivo". CyberPsychology & Behavior. 4 (3): 335–339. doi:10.1089/109493101300210222. PMID 11710257. ^ a b Arroll, Bruce; Wallace, Henry B.; Mount, Vicki; Humm, Stephen P.; Kingsford, Douglas W. (2017-04-03). "A systematic review and meta-analysis of treatments for acrophobia". The Medical Journal of Australia. 206 (6): 263–267. doi:10.5694/mja16.00540. ISSN 1326-5377. PMID 28359010. ^ a b Huppert, Doreen; Grill, Eva; Brandt, Thomas (2013-02-01). "Down on heights? One in three has visual height intolerance". Journal of Neurology. 260 (2): 597–604. doi:10.1007/s00415-012-6685-1. ISSN 1432-1459. PMID 23070463.